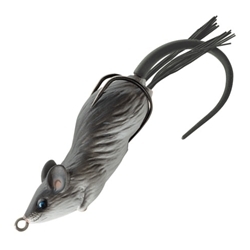 The Live Target Hollow Body Field Mouse is the perfect treat for Bass and Pike stalking in heavy cover, waiting to ambush their quarry. This Field Mouse is weedless and most effective when skirted across the tops of pads and grass mats; however it also has an incredible side-to-side walk-the-dog action when used in open runs. The intricate life-like details make this rodent so realistic you'll swear it is alive!